Oven-baked chicken is the real star of a family dinner, but it works great as a quick lunch too. There are many different ways to bake chicken meat, but a good pan is always important. When baking chicken in the oven, you need a nice roasting pan that is not too small to achieve the crisp skin and the tender, juicy meat inside that everyone loves. The pan shouldn’t be too deep, and it needs to retain heat well. Furthermore, some recipes require searing the chicken on the stove top and then moving it to the oven. Because of this, it’s hard to say which is the one best pan for baking chicken, but the four pans we will show you today come very close. 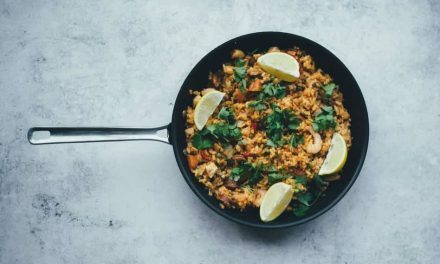 We’ve chosen two oven-safe skillets and two traditional roasting pans. 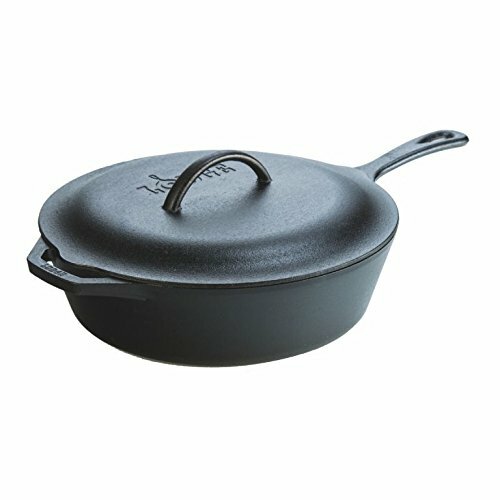 The Lodge L10CF3 Cast Iron Covered Deep Skillet is the perfect pan for recipes that start on the stove top and finish in the oven. Cast iron is known for its heat retention properties – once cast iron gets hot, it stays hot for a long time. This allows you to maintain a stable temperature in the pan when transferring chicken from the stovetop to the oven. The pan is 12 inches wide and 4.5 inches deep which is a good size for making chicken thighs or chicken breasts, for example. It has a long handle on one side and a small helper handle on the other. You do need to handles to lift this pan up because it is quite heavy. It also comes with a nice cast iron lid. Both the lid and the pan are completely oven safe. The skillet comes pre-seasoned but the seasoning needs to be maintained. The cookware from Cuisinart’s Chef’s Classic Nonstick Hard-Anodized collection is made of hard anodized aluminum with a nice graphite finish on the exterior. 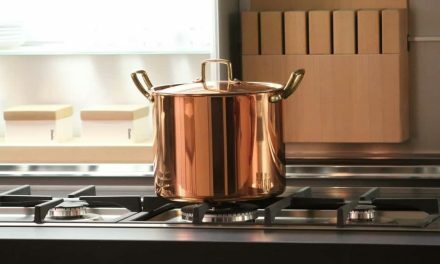 The cooking surface has a special non-stick finish that is PFOA-free and reinforced with titanium. This makes it safe to use at temperatures up to 500 degrees Fahrenheit (in the oven, too). 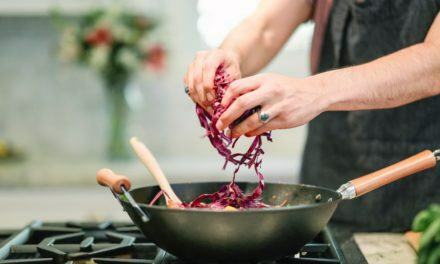 The coating is much tougher than regular non-stick coatings, so much so that you can even use metal utensils with this pan without worrying about damaging the coating. The Everyday Pan from this collection is 12 inches wide, which is a nice size for cooking chicken along with vegetables or other additions. Instead of a long handle, this pan has two loop handles on the sides which makes it perfect for transferring from the stove top to the oven. The Cuisinart 625-30D Chef’s Classic Nonstick Hard-Anodized 12-Inch Everyday Pan with Medium Dome Cover also comes with a domed lid made of tempered glass with stainless steel rims and handle. The lid fits really tightly and creates ideal conditions for braising, for example, which often required when cooking chicken. Cast iron cookware is a great choice for roasting meats. Cast iron roasting pans are heavy, durable, and powerful. Le Creuset has been making cast iron cookware since 1925 so one should expect they know what they are doing. Their Signature Cast Iron Rectangular Roaster is a great old-school, heavy pan that will last for years. It is made of enameled cast iron. The enamel coating on the exterior is quite durable and it doesn’t start chipping off even after years of use. It also comes in a variety of colors which is nice. On the other hand, the inside enamel is sandy white with a nice glassy finish. 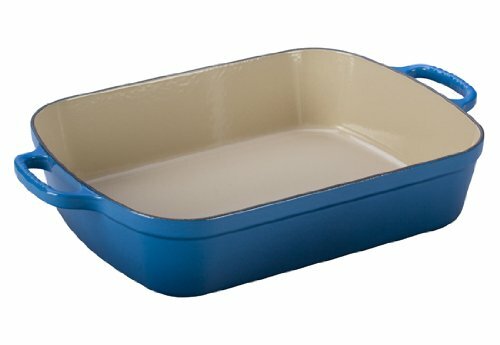 The Le Creuset Signature Cast Iron Rectangular Roaster is 14.5 inches long (without the handles), 11 inches wide, and 3 inches deep. This makes it big enough for fitting a whole chicken. However, this pan is also quite versatile – it can work just as well for lasagna and casseroles, for example. Finally, you can use this pan both on the stove top and in the oven, and since it’s cast iron, it will retain heat really well. This pan works with all kinds of hobs, including induction. When it comes to roasting whole chickens in the oven, many people will argue that the best way to do it is using a rack. This method allows you to achieve evenly cooked meat with crispy skin. You can also roast vegetables at the same time in the pan beneath the rack so they soak up all of the drippings from the chicken. Both the rack and the pan are made of solid stainless steel. 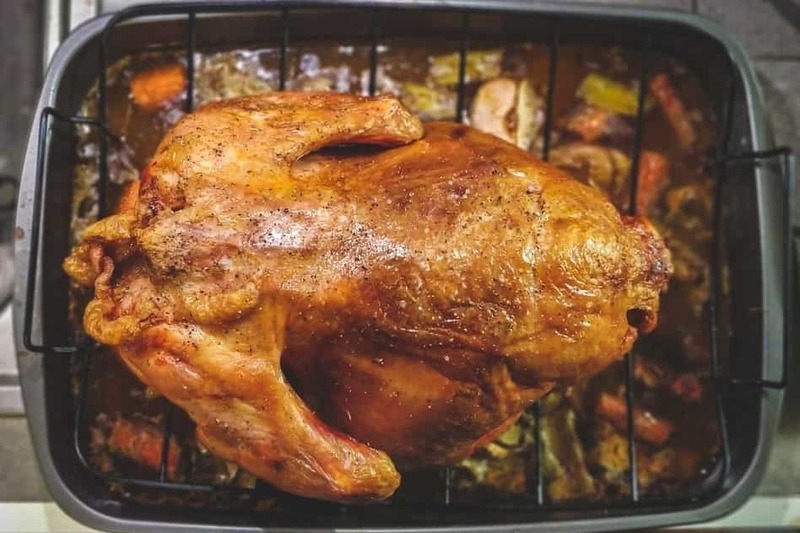 The rack is U-shaped, which provides better air circulation than classic flat racks which is very important, especially if you are cooking a whole bird. The rack on this pan is removable, though, which makes it much more versatile. When it comes to roasting pans it is the small details that can really make a difference. 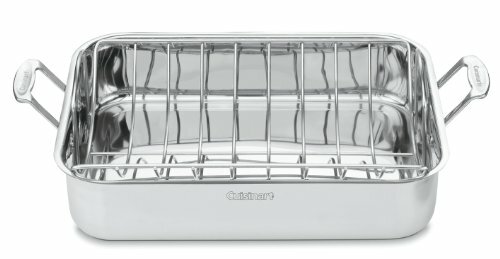 The Cuisinart 7117-16UR Chef’s Classic Stainless 16-Inch Rectangular Roaster with Rack has two raised stainless steel handles that make it much easier to handle this pan which is very important since it can get quite heavy when filled with food. Baking chicken can be really fun to do and it certainly makes for a great dinner. Having the right pan at hand can make things much easier and more enjoyable. We definitely loved baking chicken in cast iron cookware. The Lodge L10CF3 Cast Iron Covered Deep Skillet and the Le Creuset Signature Cast Iron Rectangular Roaster differ in shape and size, but they both provide awesome results. However, cast iron is quite heavy and not everyone likes this. 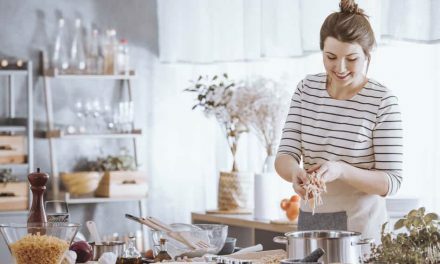 If you prefer stainless steel or non-stick cookware, the Cuisinart 625-30D Chef’s Classic Nonstick Hard-Anodized 12-Inch Everyday Pan and the Cuisinart 7117-16UR Chef’s Classic Stainless 16-Inch Rectangular Roaster with Rack are both good choices for making chicken.